Having a pool in your backyard is a great privilege. It can be used as a setting for an outdoor party, it is a fantastic focal point for the backyard and, most importantly, it offers the ability of cooling down during hot summers and allows you to relax and even feel rejuvenated. However, pools are not resistant to the passing of time, and after some years, you may face problems such as leaks, dated mechanical equipment, out of style design, worn out materials and dry ambience. If you feel like it is time to give your pool a makeover, but can’t afford extensive projects, here are a few ideas that fit everyone’s budget. Most basic pools have simple floodlights which, let’s face it, don’t look at all amazing when the sun goes down. Fortunately, there is a cheap way to deal with this. By installing LED lights, you are treating your pool to a touch of glamour. You can even install LED lights under the water in different colors and immediately transform the entire backyard. As if that is not reason enough, LED lighting is also more energy-efficient than most of the traditional options, so, in the long run, you will save some money too. When the waterline tile hasn’t been updated for a long time, it usually looks worn out and dull. Don’t leave it looking like this, when this is actually one of the most affordable pool remodeling projects you can opt for, and it is quite rewarding. By simply updating your old waterline tile, you almost get a whole new pool. If your pool didn’t even have waterline tile, that is a reason more to get rid of the stone or pebble finish above the waterline, and switch to tile for a more contemporary look. If your pool plaster is looking worse than before, perhaps it is time to finally do something about it. Dull and lifeless plaster takes away all the charm the pools should have, but don’t worry, this is nothing that a bucket of quality pool paint can’t solve. Pool paints are usually very affordable and the painting process is quite simple. If you choose the paint well, the results might even come close to the far more expensive plastering of the pool. In the end, your pool will get a shiny and reflective layer of paint that will make it look brand new. If you truly want your pool to stand out and look entirely differently, you can introduce an extra water feature. This might stretch your renovation budget a bit, but it is still one of the less costly pool remodeling projects. You can include features like scuppers, sprayers and waterfalls and finally liven up the uninspiring pool zone with motion and sound. Fire pits near and around the pool are becoming very popular, and once you see how they look, you will not be surprised why that is so. A small fire pit installation can cost only about couple hundreds of dollars, but it adds so much dynamic, intensity and life to the pool area, that it is surely money well spent. This project may not bring any aesthetic change when it comes to your pool, but it can be a true game-changer when it comes to your health and the appearance of your skin. Salt water systems have become increasingly popular because they are easier on the skin and eyes, but also because they are cheaper to maintain. These systems use salt to produce chlorine in the water, so you don’t have to buy, store, handle and add the chlorine via traditional methods. Another change that may not be visible to the eye, but your wallet will definitely sense it. Switching to energy-efficient pool equipment will make your pool less costly to operate and thus make your life easier. Some of the great products that are currently available are solar-powered features (lights, heaters, etc. ), energy-efficient filters and variable speed pool pumps. Another thing you can do when it comes to pool equipment is to get an all-in-one pool automation system which can be controlled via smartphone. 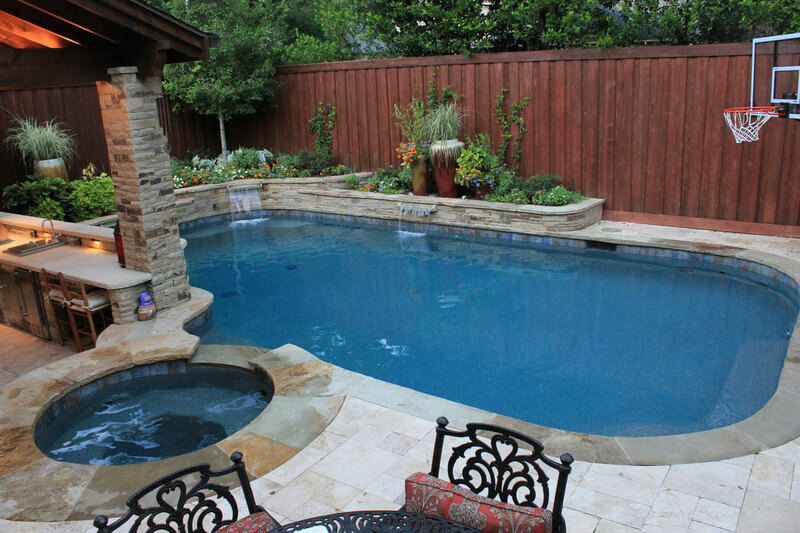 Pool remodeling is usually a very expensive, time-consuming and otherwise challenging project. However, by using these methods, you will be able to give your pool a new look and improve its functioning without overspending.